Heart of the Universe takes readers on a magnificent journey to the heart of the universe and back. Written in the structure of a Platonian dialogue, this philosophical tour de force reflects the author’s 15-year journey of discovery, while at the same time presenting all of Centerpath’s key ideas. Only 40 novel-sized pages in length, Heart of the Universe provides an accessible peek into the complex concepts of order, symmetry, and the universe’s creative force—and how our lives are tied to nature, the cosmos, and the divine. 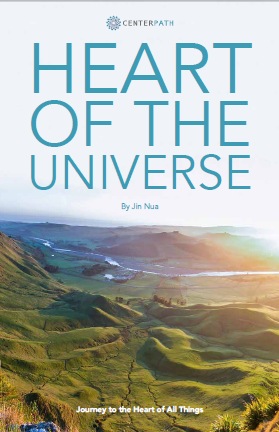 Heart of the Universe provides the bridge from the theoretically-rooted Centerpath Papers to Centerpath’s practical applications in nature and our lives. 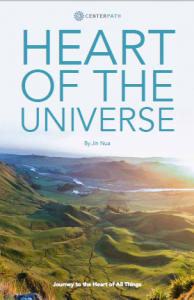 You can buy Heart of the Universe in .pdf at Centerpath.org or in Kindle format on Amazon. The book’s introduction is included below. Also—check out this book trailer to learn even more! I began writing this book on a beach in Thailand in 1997. It’s also, coincidently, where I completed it some fifteen years later. Its roots lie in simple enough origins –a newfound fascination with nature. This simplicity however soon gave way to something much broader and complex ultimately consuming tens of thousands of journal pages and several intermediate manuscript versions until – finally in February 2013, I was able to write out the version of the book you’re reading right now in just two days. To me, this biographical narrative isn’t entirely satisfactory and leaves many issues unresolved. After all, it is a bit strange such a short work took so long to develop. The question ‘why did it take so long?’ and ‘what would possess someone to stick with it?’ naturally emerge. To the first question all I can offer is it took an extraordinary time to develop because I had to travel a great distance. It’s a long way to the heart of the universe and there are no shortcuts or signposts to guide you along the way. It took fifteen years to zero in on it. The distance I had to travel was a main factor. The second question is just as difficult to address. What keeps someone after something so long and at the risk of such great disappointment? The journey was in fact arduous and kept me from things I wanted. The discomfort I felt overcoming disappointments with slow progress, realizing years of good work wasn’t good enough, and gathering the energy to begin yet another rewrite all proved very painful at times. So I had to ask myself –why did I stick with it? Was it for the excitement and fascination? Was it for the money or maybe the fame and recognition? Was it for pride in finishing what I’d started? Each factor surely played a part but over time what I realized is writing a novel is a lot like marriage. We stick to it for many reasons but in the end we do it for love. So in a flash I discovered the reason why I wrote this book –out of love. A love for great ideas and their expressions in art, music, and writing. A love for the heartfelt, kind, and caring souls of the silent majority whom put aside struggles for fame and power and, instead, are good to friends, family, and our precious planet. A love of the great unknown and a hope for something better yet-to-come. And a love and reverence for the Creator whom set this exquisite universe and all its goodness and rightness into motion. What other than love to keep the flame alive when circumstance and the demands of life could have easily extinguished this grossly overdue project. And a love so bright I hope it touches the heart and souls of anyone who reads these pages. Inspiring them to reconnect with our world and take positive steps towards building better lives, communities, and nation on this precious planet of ours. So, please join Jin Nua and Moesre Bescoca (pronounced MO-ES-RE, BE-SKO-KA), on a magical tour to the heart of the universe and back. Hopefully, your experience will bring the same great delight and solace I found on my long journey toward delivering this book to you here today.